The invention of the refrigerator has allowed the modern family to purchase, store, freeze, prepare and preserve food products in a fresh state for much longer periods of time than was previously possible. For the majority of families without a sizeable garden in which to grow vegetables and raise animals, the advent of the refrigerator along with the modern supermarket led to a vastly more varied diet and improved health resulting from improved nutrition. Dairy products, meats, fish, poultry and vegetables can be kept refrigerated in the same space within the kitchen (although raw meat should be kept separate from other foodstuffs for reasons of hygiene). The refrigerator allows families to consume more salads, fresh fruits and vegetables during meals without having to own a garden or an orchard. Exotic foodstuffs from far-off countries that have been imported by means of refrigeration can be enjoyed in the home because of the availability of domestic refrigeration. The luxury of freezing allows households to purchase more foods in bulk that can be eaten at leisure while the bulk purchase provides cost savings. Ice cream, a popular commodity of the 20th century, was previously only available by traveling long distances to where the product was made fresh and had to be eaten on the spot. Now it is a common food item. Ice on-demand not only adds to the enjoyment of cold drinks, but is useful in first-aid applications, not to mention cold packs that can be kept frozen for picnics or in case of emergency. Domestic refrigerators and freezers for food storage are made in a range of sizes. Among the smallest is a 4 L Peltier fridge advertised as being able to hold 6 cans of beer. A large domestic fridge stands as tall as a person and may be about 1 m wide with a capacity of 600 L. Some models for small households fit under kitchen work surfaces, usually about 86 cm high. Fridges may be combined with freezers, either stacked with fridge or freezer above, below, or side by side. A fridge without a true freezer may have a small compartment to make ice. Freezers may have drawers to store food in, or they may have no divisions (chest freezers). Fridges and freezers may be free-standing, or built into a kitchen. Compressor refrigerators are by far the most common type; they make a noticeable noise. Absorption or Peltier units are used where quiet running is required; Peltier coolers are used in the smallest refrigerators as they have no bulky mechanism. Compressor and Peltier refrigerators are invariably powered by electricity; absorption units can be designed to be powered by any heat source. A noticeable difference between the two types is the absence of CFC-compounds with the Peltier coolers (these use a different method of cooling). Peltier coolers however do use more electricity. Oil, gas (natural gas or propane) and dual power gas/electricity units are also available (typically found in RV's). Solar refrigerators and Thermal mass refrigerators are designed to reduce electrical consumption. Solar refrigerators have the added advantage that they do not use the toxic CFC-compounds which are still (somewhat) damaging to the ozone layer. Typical solar designs are absorption refrigerators that use ammonia as the working gas, and employ large mirrors to concentrate sufficient sunlight to reach the temperature required to free gaseous ammonia from the solvent. Most thermal mass refrigerators are designed to use electricity intermittently. As these units are heavily insulated, cooling load is limited primarily to heat introduced by new items to be refrigerated, and ambient air transfer when the unit is open. Very little power is therefore required in typical use. Refrigeration units for commercial and industrial applications can be made any size, shape or style to fit customer needs. SEVER Corporation is oriented to the industry, energy sources, transport, farming, households for many years from the aspect of marketing and its programme. The production programmes have been developed from electric machines, particularly electric motors, and later geard motors as well as the basic programme from generating sets and complex products such as pumps, fans, regulators and control devices, devices for farming and food-processing industry, automatic irrigation lines and complete systems and devices on the principle of engineering and complete factories. SEVER gained great experience in production and fitting equipment for food-processing industry. Within the farm work of the mentioned lines are organized production of stalking machine, barboting machine, calibrator, destoring machine, freezing tunnel, balance for large-scale weighing line conveyors and other plants and equipments depending on processing techno-logy. Line capacity depends on fruit kind and processing technology, end it is between 2000-5000 kg/h. The lines (fig. 4) are provided for vegetable freezing depending on its kind and processing technology are developed of rotary washing plants, grape-seed separator, cutting plant, freezing tunnel, weighing and packing machines, transport plants. Line capacity depends on the kind of vegetable and it is between 2000 to 3000 kg/h. 1. chips; 2. French fries; 3. puree. The preparation of potato for processing is almost identical or differs a little from the processing procedure of all other kinds and it usually consists of discharger, feeding silo, washing plant and destoner, barboting plant, peeler (abrasive peeler), cutting plant, inspection conveyor belt, transport plants. Potato productscan be supplied in many shapes and guises i.e. sliced, wedges, roast, mash, formed and crumbed etc. The list is almost endless! Flo-Mech supply either single machines or complete processing lines from raw material intake through cooling, freezing and packaging. Equipment size is usually throughput dependent, but the wide range available is suitable for lines from around 100 kg/hr to around 10 tph, of finished product. Lines can be specified with abrasive or steam peeler options, mechanical or water knife cutters, screw or belt blanchers and manual or electronic inspection. Equipment to produce potato mash varies depending on the application, but capacity ranges from around 100 kg/hr up to 2500 kg/hr, and can incorporate automatic defect removal by utilizing the Hoegger Separator. In the further processing there are used machines and plants depending on the kind of product and the particularity of technological line: blanching plants, starch separator, frying plant, vibrating separator, defating plant, rotary machine for salting, drying plant, transport plants, packing machines. Capacity of line depending on the kind of product is 100 to 1000 kg/h of finished product. According to requipment of techological process of individual product, the line consists of feeding conveyor or platforms, roasters, cooling table, conveyors, storehouse of roasted products, mill, plants for packing underground products (on request), plants for packing ground products (on request). Capacity of plants for roasting and milling of coffee (fig. 5) is 30, 60, 120, 240 and 300 kg/h. SEVER produces complete production plants for extruded -expanded products on the basic of corn grits (fig. 6). Technology of extrusion and expansion consists of preparation of raw material, extrusion-expansion, drying, flavouring, packing. By modification of the individual plants and technological lines it is possible to make extruded and expanded products from other raw materials. Lines are made for capacities of 60 and 120 kg/h. Longtime experience in engineering and production of different types of mixers for powdery and fine - grained products are resulted by organization of the whole mixing technology of these products. Systems are used for mixing all kind of powdery and fine - grained products in food - and other industries. 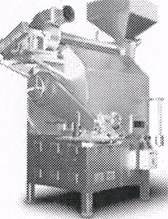 The base for this system are made of the following technological operations: feeding; mixing; roasting; transporting. The system can be designed as a self standing complex or it can be included into various technological lines with manual and automatic control. In cooperation with APV, the famous European company, SEVER offers the production of complete equipment and plants for processing medicinal herbs. Processing technology of medicinal herbs includes storage of raw material, preparational dehydration, dehydration, extraction, distillation, packing. These lines are designed and manufactured depending on the kind of medicinal herb assortment of required capacity and final products. Taumel, the pioneer of Orbital Headforming, is proud to present its renowned machines and equipment. The range of equipment was designed to combine the best in today’s technology with the high quality and precision which you expect from Taumel. The streamlined design lends itself to modern manufacturing methods and allows high performance equipment to be built at competitive prices. Taumel Orbital Headforming is a noiseless radial forming and fastening system which replaces conventional riveting, staking, spinning, hammering, pressing, peening, rolling, welding, upsetting and cold heading operations – all with one machine. Taumel orbital headforming machines use speedy changed single or Multi-Spindle Taumel heads to hold forming tools at a constant angle. The tools orbit a stationary work piece but do not spin. As the tools follow their orbital path, their tips press on the work piece on a line radiating from its center. With all of the pressure applied on this line a flowing wave of material forms ahead of the orbiting tool. The material has time to flow properly because only a minute quantity is displaced during each spindle revolution… as friction is minimal, no tearing of the work piece occurs. This results in a clean, polished, non-porous surface on the formed material. There is no measurable change in molecular structure – rivet heads, joints and flanges of maximum strength are created. 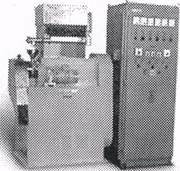 Taumel machines incorporate easy-to-read scales for greater accuracy and repeatability. Stroke and pressure are fully adjustable and can be precisely maintained at the chosen level. Pressure for forming is generated by either pneumatic or hydraulic power – depending upon the required heading force. Taumel machines incorporate easy-to-read scales for greater accuracy and repeatability. Stroke and pressure are fully adjustable and can be precisely maintained at the chosen level. Pressure for forming is generated by either pneumatic or hydraulic power - depending upon the required heading force. Taumel Orbital Headforming relies on precisely controlled dwell times and tool pressure to form the shapes that you want. The machines make perfectly formed rivet heads and other shapes from both round and non-round stock manufactured from malleable materials. Taumel machines can flare, flange, join and swage. They also assemble pins, studs, shafts, axles and hubs with unvarying accuracy and repeatability. The strength, finished appearance and batch-to-batch uniformity of Taumel Headformed assemblies remain unmatched by other systems. 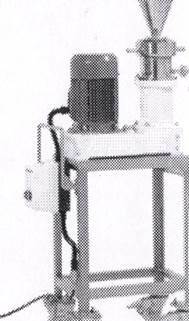 PMS Colloid Mill® (fig. 7) is used frequently for suspension or emulsion preparation. It provides extremely high shearing force. Colloid mil is favored over homogenizing mixer when the emulsion is viscous or when suspended solid are present in the mixture. Function of PMS Colloid Mill ® is to disperse, emulsify and reduce the size of solid particles into fine uniform particle size. It grinds, mixes and blends product in a more economical and faster way. Rate of throughput varies inversely with the product viscosity. The action of colloid mill is based on the shear produced between cone-shaped discs, one of which is stationary while the other rotates at a high velocity. The distance between two discs can be varied, thereby affecting the amount of shear applied to particular system. The suspension or emulsion is gravity fed into the hopper. The suspended particles are forced through the adjustable gap between the stationary and the rotating discs. The sheared and homogenized particles are then passed out through the bottom of the mill. The product can be recycled if required until the desired product condition is achieved. Pharmaceuticals, cosmetics, food, chemical, body care product. GMP Compliance, economical and Efficient, versatile for wide product, consistent and repeatable, easy to operate, clean and maintenance. 2. Grinding elements (Rotor and Stator) made of durable chrome steel hardened. 3. Grinding element's gap can be varied with manual adjuster. The Prodel DirectLine module (fig. 8) family is an inline asynchronous pallet transfer pallets sizes available for this system are 25x28cm or 30x40cm (10"x11" approximately). There are several different modules to choose from for either automated operations. These modules, once placed on a support structure, assembly line. Manual stations are available with a number or ergonomic platforms, foot rests, adjustable center tables plus much more. ai module integration can vary from simple components such as pneumatics for place or pressing operations to a sophisticated Cartesian, Six Axis, or SCART. approximately the same cycle time. 4. Full access to mechanical and electrical components. 5. 25x28 pallet can handle a sixteen (16) pound pay load. 6. 30x40 pallet can handle a twenty (20) pound pay load. Many food-processing plants today are literally washing profits down the drain. This industry typically uses a large volume of water to process food products and clean plant equipment, yielding large amounts of wastewater that must be treated. Excessive water use and wastewater production adds financial and ecological burdens to the industry and to the environment. However, food processors can take actions that will dramatically reduce water use, wastewater production, and the high costs associated with these problems. Using water for cleanup in food processing plants flushes loose meat, blood, soluble protein, inorganic particles, and other food waste to the sewer. Some of these raw materials could be recovered and sold to other industries, but instead are lost. Also, most of this waste adds a high level of biochemical oxygen demand (BOD5) to the wastewater. Wastewater treatment plants use BOD5 levels to gauge the amount of waste that is present in water - the higher the BOD5 level, the more treatment this wastewater will require. Sewer plants add surcharges for each pound of BOD5 that exceeds a set limit. These charges can cost the company hundreds of thousands of dollars each year. Food processing companies can benefit by learning about current methods and interventions that can assist in effectively managing their water resources. Without the appropriate knowledge and use of these wastewater management techniques, these companies will continue to lose money through water use charges, raw material losses, sewage surcharges, and possible fines from environmental agencies. With the public emphasis on environmental quality, the food industry has further incentive to reduce its water usage and its wastewater production. This publication discusses how one food processing company became aware of its wastewater problems and reduced costly waste with assistance from the North Carolina Cooperative Extension Service and the North Carolina Pollution Prevention Program. By implementing a comprehensive water management and waste reduction program, the Equity Group has dramatically reduced its BOD5 production by 77 percent and its water use by 30 percent. Food processing machinery and food processing equipment includes machinery used for a wide range of food processing processes, such as grinding of cereals, spices and other food particles. We are the manufacturers of food processing machinery - Grinding Mill, in which grinding media is Flour Mill Emery Stone which is manufactured by N.A. Stones with oxychloride process. Our Flour mill machine is good for health and easier in grinding. With this particular grinding media our food machinery is better than the one made of iron grinders. For in case of iron grinders, the grinding is done on high temperature which results in loss of proteins, vitamins etc. The chances of skin diseases and cancer also gets increased in iron grinders.